Ben Clanton stopped by to talk mail and narwhals in this week’s Five Questions. The scores of clever details in his latest book IT CAME IN THE MAIL make it a joy to reread, with new treasures to stumble upon each time. I hope you enjoy getting to know the person behind the book and the story behind the story as much as I have. How did the idea for It Came in the Mail come about? It Came in the Mail is in many ways a sort of love letter to mail itself (yep, pretty meta, especially as Liam writes a letter to his mailbox in the book). Like most love letters it came about one day while I was daydreaming about my amore (hope my wife forgives me for this analogy). I adore getting mail and sending it, but more than anything I love that moment just before opening the mailbox when anything could be in there. Thoughts about that magical moment were banging about my brain while I was doodling in my sketchbook and somehow all those intangible 'what ifs' became a drawing of a dragon poking its head out of a mailbox. 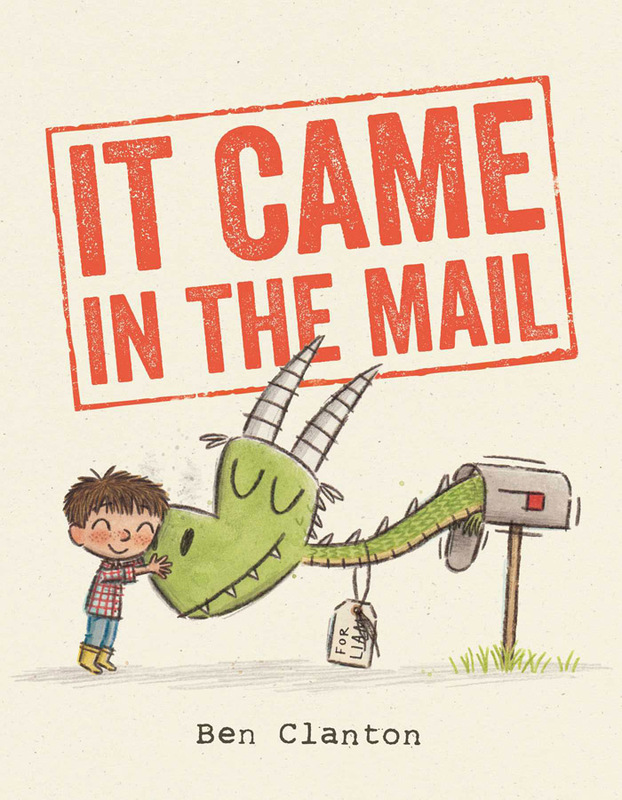 Right away I knew there was a story involving that dragon and mailbox that I had to tell. There are so many meaningful details in It Came in the Mail. Can you tell us the story behind some of them? I love it when books have little special details that can be discovered in rereads and It Came in the Mail really lent itself well to putting lots of little easter eggs in. For instance, on some of the items Liam receives in the mail there are postage stamps and I wanted to have some fun with those stamps. I ended up using drawings kid readers had sent me in the mail and some drawings from my childhood for the images in the stamps. The illustrations on the stamps also generally fit with what the stamp is on so a dino drawing stamp on the triceratops skull and a king stamp on the crown. It is hard to make out too much detail on the stamps and I doubt many people will notice them or at least get the significance, but they are one of the parts of the book I am particularly fond of. Also, I included some shout-outs to friends and family. At one point the huge rubber duck has a label on it that says 'for Sutter' and it so happens that my brother-in-law is named Sutter and he collects rubber ducks. There is also a dancing blueberry on that same page which Liam's friend Jamel says Amelia would love and I have a dear friend named Amelia who I think would appreciate a dancing blueberry. You might also notice that the name Liam spells a different word when spelled backwards. Had to go with that name for him as soon as I happened upon that. Oh, and some characters from other books of mine make cameos such as the bird from Something Extraordinary and naturally I had to have a couple mustaches make it in, which I have done with most of my books ever since Mo's Mustache. Other little details . . . there is a mini visual story about a hat stealing crab in the book which is a shout-out to Jon Klassen's 'hat books', the crown and some overarching design elements are a nod to Where the Wild Things Are which is a favorite of mine, and I included a real stamp of Benjamin Franklin in one of the illustrations because he was the very first Postmaster General for the United States. AND related to the Benjamin Franklin stamp is the illustration of the mailbox on the tile page on which the number 726 appears for Liam's address which July 26th is the day the U.S. Post Office was created. Weirdly I just bought my very first house a couple months ago and the number of the address happens to be 762, which has rather messed me up when telling people my new address as I seem to always want to say 726 instead of 762. There are oodles of other little things but I will stop myself there. Oh, except I did want to mention that there are a couple Charlie Brown references in the book, which I was pretty sure was mandatory when doing a mail-themed book. Can you tell us a bit about your upcoming book, Narwhal, Unicorn of the Sea? 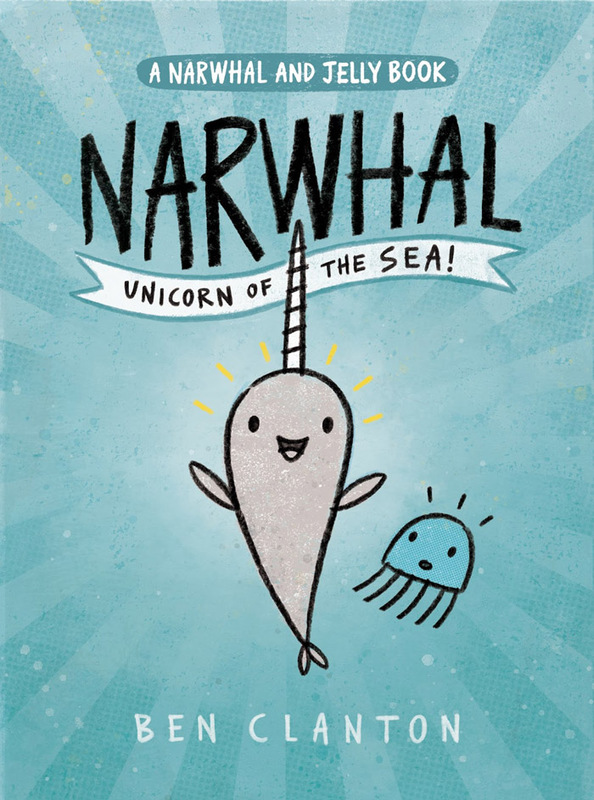 Narwhal: Unicorn of the Sea (coming October 4th!) is the first of an early graphic novel series about Narwhal the narwhal and Jelly the jellyfish. The two make for unlikely friends, especially as they each think the other is imaginary and while Narwhal is very happy-go-lucky, Jelly is no-nonsense. I call the book an early graphic novel but the format is really hard to pin down. It is a bit like a picture book but with panels and multiple comic-like stories and twice as long. Things you will find in the first Narwhal and Jelly book . . . waffles (oodles of waffles! 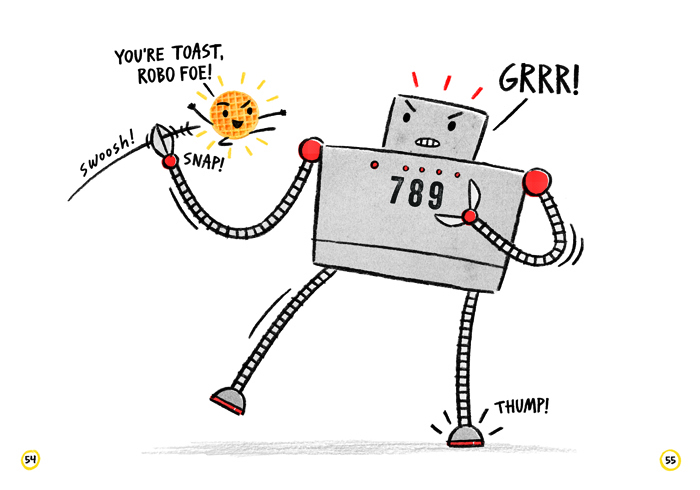 ), a giant robot, the 'best book ever' which happens not to have any words or pictures, and loads of podtastic silliness. I'm currently diving into final art for the second Narwhal and Jelly book called Super Narwhal and Jelly Jolt. I listen to loads of books while illustrating. Recently I've been binge listening to books by Brandon Sanderson and Orson Scott Card, but currently I'm trying out a book by B. V. Larson called Battle Cruiser. And because I need something lighthearted to break things up I've been listening to Roald Dahl books too. I'm also reading some books about being a dad as I'm as of two months now a new father. And as for picture books I've been rereading a lot of Bill Peet. If you weren't writing/illustrating children's books, what do you think you would be doing? I love playing basketball so I would totally go for being a professional basketball player, but in actuality I doubt that was ever in the cards for me. Most likely I would be doing something creative or kid-related or likely the two together . . . teacher? Librarian? I also have a huge passion for all things aquatic and think being a marine biologist would be pretty great. So maybe I would be teaching kids and octopi how to play basketball? Thanks for stopping by, Ben. 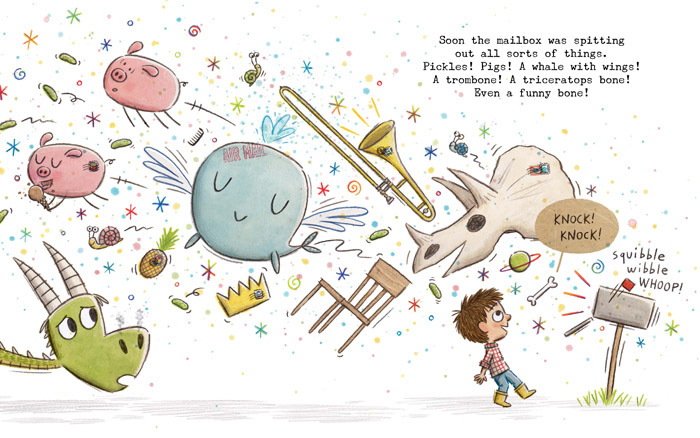 We’re looking forward to Narwhal and Jelly’s adventures in October! Follow Ben on Instagram, Twitter and his blog Squiggles & Scribbles to keep up to date on his latest doodles, illustrations and projects.